As usual, and unsurprisingly, I am late with my promised follow-up post on the latest Oracle BI EE release, version 11.1.1.6.2BP1. I wanted to, still want to, and hopefully will do, a series of short posts on the new release, focusing on a few areas, and leaving out others. The three areas I hope to focus on in the first pass are the new mobile app, geo-spatial visualizations, and some exciting new data visualizations. 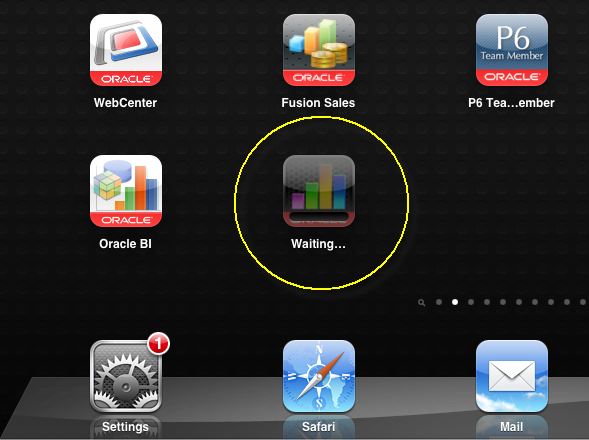 Starting with the first one, the Oracle BI Mobile app. This, Oracle Business Intelligence Mobile HD, is a new app that Oracle released along with the server software, version 11.1.1.6.2BP1, and the app has been available on the Apple iTunes App Store for a little over a month now. As an aside, I must say we were very pleased with the hassle-free and lightning quick review and approval process from Apple. Not that one would expect anything different. So, where can you get the new app from? I think I just answered that, i.e. from the Apple iTunes App Store. But I do apologize. Let me elaborate. As you would expect, there are two ways to get the app. Three, if you are an Oracle employee, but let's just keep the post focused on the general public. If browsing from your computer, you can launch the iTunes application. From there, you can either browse to the Business apps category, or directly search for the app by typing "Oracle" or "Oracle BI" as your keywords. Either will do just fine. Note here that you are going to get TWO results for the Oracle BI Mobile app. Yes. Nice, isn't it? Choice is always a good thing. So what's up with the choice here? If you are running the latest and greatest version of Oracle BI, 11.1.1.6.2BP1, then you should, no - you must, use the "Oracle BI Mobile HD" app. That's because this app has some very, very nice features, and also because, and this is where things get serious, this app will connect only to the latest version of Oracle BI EE, viz. 11.1.1.6.2BP1. 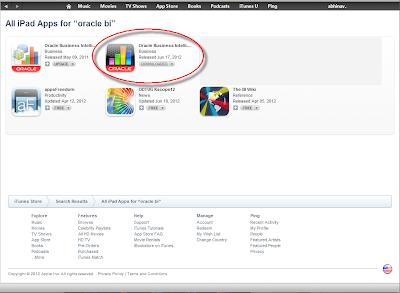 The new Oracle BI Mobile HD app,version 11.1.1.6.2BP1. At this point, you may have a question. Even if you don't, I think I am going to ask a rhetorical question and answer it, even though rhetorical questions are not meant to be answered. 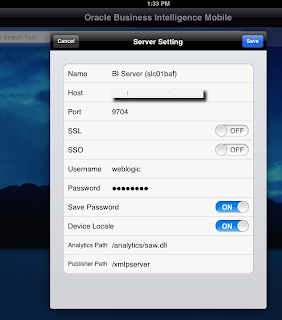 What if I have the 11.1.1.5.0 version of the BI Mobile app installed on my iPad, and what if I want to connect to Oracle BI EE, 11.1.1.6.2BP1? Well, nothing to fear. The app will connect just fine. You will, of course, not get the really nice stuff that the new Oracle BI Mobile app has, but if you do not want to try out the new app just yet, that's ok then. So, to return the narrative to the new app, what's the other way you can get the app? Over the air, that's how. From your iPad, you can launch iTunes, and from there locate the Oracle BI Mobile HD app, tap to install it, and you are on your way. This app is about 9MB in size, so the download should be done before you can say, "that was fast." No, really. Try it. Oh, by the way, as an aside, I remember a discussion with our product development team in 2010, when we were working on the earlier BI Mobile app (version 11.1.1.5.0). There was a concern about keeping the size of the app down, because an app that was 10, 20MB, or larger in size could have deterred some from downloading the app. So went the thinking. I read an article on the web a few days back that mentioned some gaming apps that are more than 1GB in size! Times change. And fast. And how! Anyway, a 10MB app is a mere trifle. On a device running on an LTE network this should take a few seconds. The install process is also very, very quick. After the app has installed, the next step is to launch it. Well, before that, some people like to have things arranged neatly. If you want to do that, if you want to move the Oracle BI Mobile HD to the page that you have reserved for all the other, nice Oracle apps, then you go ahead and do just that. After you have done that bit of rearranging, tap to launch the app. Now, since this is going to be the first time you would be starting the app, there is a bit of legalese that needs to be cleared off first. It is the "End User License Agreement", and you, as the end-user, need to accept it. Swipe to scroll to the bottom, click tap "Accept", and that's the last time you will see that screen, I think. After that you see a screen that allows you to do three things. You can either connect, if you have a connection to a BI Server defined. You can stay offline. Or you can add one or more connections. Since this is the first time you are using the app, you will not have any connections defined and available. Since this is the first time you are using the app, you will also not have any offline content to peruse. Therefore, it behooves us to define a new connection. The new connection screen is the same as before. I.e., the same as in the 11.1.1.5.0 BI Mobile app. You need to provide a name to the connection, a useful and descriptive name perhaps. The hostname, port, and other details. If the URL you use to connect to BI on your browser looks like https://oraclebiee.mycompany.com:9704/analytics, then oraclebiee.mycompany.com is your host, 9704 is your port, the SSL option should be ON. If you are using Single Sign-On, like Oracle Access Manager, then you should check the SSO option to "ON". Else, you need to enter a username and password in their respective fields. Actually, hold that thought. You can leave the "Password" field blank, and you will be prompted for the password when you try to connect to Oracle BI EE using this connection. Actually, is there an easier way to define a connection? I mean, typing in hostnames and port numbers is not exactly fun, is it? No. It is not. So, is there an easier way? Yes, there is. Well Abhinav, are you going to talk about it, or should we use transcendental meditation to divine it from you? No, no, I apologize. That is a topic for a later post, but trust me, there's an easier way to create these connections. Ok, so we still have not seen a screen with BI on it. Yes, you haven't. And just bear with me a little while longer. If you do not like the background wallpaper on the app, you can change it. If you tap the "Wallpaper" option from the "Settings" panel, you can select from three pre-shipped screens that come with the app. I personally prefer the dark, black-ish wallpaper, but there is a blue and green wallpaper also available. Go ahead, add some color to your analytics app. Once you have defined these connections, one or more, you would also have set one as your default connection. Actually, when you added your first BI connection, that got set as your default connection, as evidenced by the little green checkmark against the connection name in the "Settings" panel. You can change the default connection to any other by simply tapping any other connection's row. From the app, if you tap the "Options" menu, the second choice says "Login (....)". This is your default connection. Tap it to connect to a BI Server. Before finishing up this post, I want to provide a short view into one specific feature, which is the location intelligence capability. 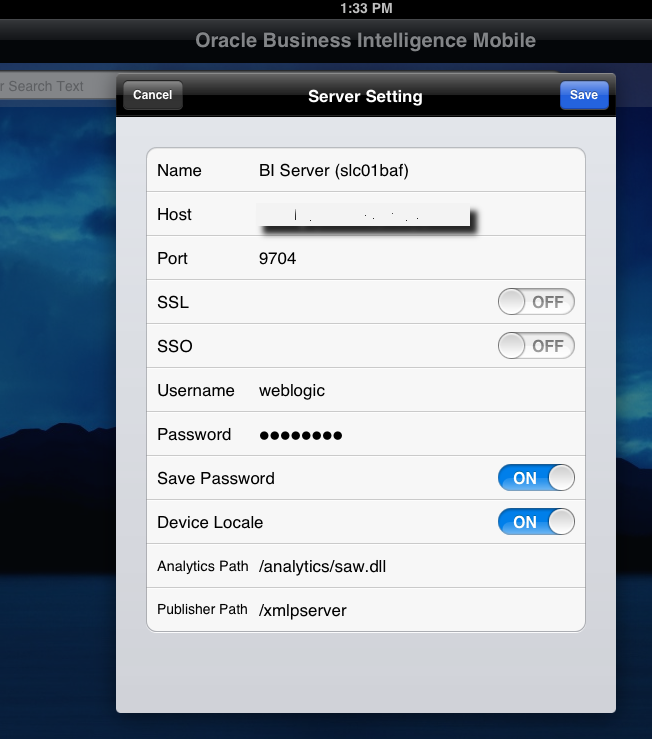 With the 11.1.1.6.2BP release, the Oracle BI Mobile app is now able to take advantage of your location. Basically, this feature consists of two parts. The first one is determining your location. The other part involves placing a pushpin on that location and zooming the map view to your location. As you can see from this screenshot below, the first time you use this feature, you will be asked to provide permission for the app to get your current location. After you allow the BI Mobile app to get your location, you will see an orange pushpin placed on your current location. The map also zooms in, not quite to the street level, but somewhat in-between the street and city level. To dismiss the location pushpin, tap the pushpin, and then tap "Remove Marker". On to writing the next post in this series. Hopefully, fingers crossed and all, sooner than later. Note: I am posting this in some haste, so I may come back and make some revisions. Shortly after posting my earlier post, announcing the availability of the Oracle Business Intelligence 11.1.1.6.2BP1 patchset, I realized I had missed out a couple of other pieces of information that would be immediately useful. These two items are the certifications information and the documentation library. Within this documentation library, there are a couple of points worth noting. 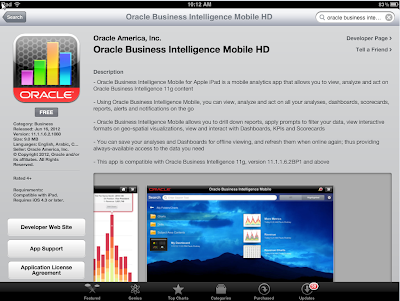 The first is that there is a new doc for Oracle Business Intelligence Mobile. It is available at Oracle® Fusion Middleware User's Guide for Oracle Business Intelligence Mobile 11g Release 1 (11.1.1) - Contents and it has PDF, Mobi, and ePub versions also available. So now you can not only download the PDF version, but also download an eBook reader-friendly version like .mobi and .epub. For a list of new user features in this release, take a look at the New Features for Oracle Business Intelligence Users - 11g Release 1 (11.1.1) chapter from the User's Guide for Oracle Business Intelligence Enterprise Edition doc. The OTN page for Middleware certifications should be updated with the BI EE 11.1.1.6.2BP1 certifications information soon I expect. I will post an update once that is available. Oracle Business Intelligence Foundation Suite 11.1.1.6.2 BP1 is now generally available, or "GA", as is more commonly known. This is a significant update to the Oracle Business Intelligence product suite as it contains two major new pieces of functionality. The first is a set of Trellis visualization capabilities that allow users to quickly create and analyze information using data-dense, word-sized, high-quality visualizations. The second is a completely overhauled and new mobile app for the suite, called "Oracle Business Intelligence Mobile" for the Apple iPad tablet device. Apart from that, there are also updates to the geo-spatial visualization capabilities, that now support line geometry types. You can either search by the Patch number, or, do a search by product, platform, and release. After logging in to the Oracle Support site, click the "Patches & Updates" tab, and you should see the "Patch Search" section. If not, then add it to your page by clicking the "Customize" button and dragging "Patch Search" to your page. From the "Product" dropdown, select "Oracle BI Suite EE". You can start typing and the dropdown filters only the hits that match your typed keywords. Click "Oracle BI Suite EE" to select it. From the "Release" dropdown, select the BP1 option. I.e., check the box next to the "Oracle BI EE 11.1.1.6.2BP1" result. You could simply click "Search", or if you are interested in only a specific platform, then select that platform from the "Platform" dropdown. I have selected "Microsoft Windows x64 (64-bit)"
This will yield a search result set comprising seven rows (not the movie "Seven"). The first file, i.e. the file numbered (1 of 7) is the installer for the patch. This is also identified by its Patch Name, "14223977". Second point to note is that this is a cumulative patch, so will include prior patches. More to follow this week.